FOXBOROUGH – In a day filled with heroes, nostalgia and excitement, a running back named Smith stood out amongst everything else. Yeah, yeah, we know. Lamar Smith probably ran for 244 yards today. He plunders against everyone else, but the poor Patriots cannot stop this guy. He set up a brilliant passing day for Jay Fiedler, and the Dolphins sent the Patriots home with their tails between their legs, and the wrecking ball will be here about Tuesday or so. Lamar Smith gained only 33 yards on 12 carries. But Antowain Smith socked it to Miami for a career high 156 yards rushing on 26 carries. It was the total antithesis of the earlier meeting down at ProPlayer Park. Everything was different, which Smith did the best, Fiedler’s passing, Miami’s intensity. Oh, and the final score too. Foxborough Stadium got the sendoff she so dearly wanted. It all began with a “resurrection”, bringing out a man everyone presumed was dead to conduct the coin flip. It ended with the completion of the resurrection of the 2001 Patriot season, a season that now is headed for a playoff berth, and maybe much more. How perfect. Now I believe with all my heart that Elvis lives. You see him on the Patriot helmet. Now Henderson, riding his trademark snowplow just prior to the coin flip, makes all who said that he was deceased look rather foolish. Elvis is alive, and it’s a shame that someone didn’t ask him to sing the Star Spangled Banner. Or, even better, I’ll Have A Blue Christmas. Both teams will have a blue Christmas, for different reasons. The Patriot Blue will likely rule the AFC East, thanks to their 20-13 win Saturday at, for the final time, Foxborough Stadium. The Miami Dolphins go back to Dade County, feeling as blue as all those democrats down there who only got to vote for president once and don’t know how to punch out chads. The Patriots blasted the Dolphins in the first half, with trickery, muscle and spirit. Then they put it into cruise control and held on for the win. It would have been nice for the win to be more convincing, as it could likely have been. But Bill Belichick and the coaching staff managed this game so well that the struggles of the offense in the second half really didn’t matter. Two distinctive plays defined the day for the Patriots. Even though Smith was the statistical star of the game, as well as the main man who dictated the pace, personality and flow of the game, he was not involved in the two main moments which ultimately brought victory to the Patriots, as well as final high glory for what used to be Schaefer Stadium. Time out. Go straight to your medicine cabinet. Valium. Xanax. Nitro-glycerin. You’ll need at least one of the three. Gulp. Feel okay? Good. …Tom Brady. Left completely all alone in front of a defense where every single player bit right, Brady caught Faulk’s perfect soft toss and scooted out of bounds at the Dolphin 21 for a 22 yard gain. The John Elway special sent Foxborough Stadium into utter delirium. Smith then ran for 19 yards and 2 yards. That adds up to 21, so the 2-yarder got the Pats six points. Miami was totally deflated at this point. This marked the first of four straight scoring drives for the Patriots. Patrick Pass took a screen toss from Brady and rambled 23 yards for a score (his first career NFL touchdown catch), then Fred (Jets Hate He) Coleman caught an Adam Vinatieri pooch kickoff following an ensuing field goal at the Miami 42. Vinatieri would again kick a field goal to make it 20-0 Pats. But the Dolphins would fight their way back into this game. It was 20-6 midway through the fourth quarter when the Patriots had their second key moment which all but salted things away. The Dolphins were mounting a desperate drive, and had the ball at the Patriot 10, fourth down and 7, and 9:04 left in the contest. Dave Wannstedt elected to go for the first down rather than kick a useless field goal. Fiedler hit Smith over the middle, and got first down yardage. But once he crossed the three-yard line, Tebucky Jones clobbered him and dislodged the ball. Roman Phifer fell on the ball at the one. It didn’t lead to a Patriot score, but the Patriots were able to run 4:51 off the clock, and Miami would get the ball back with 4 minutes left and no time outs. The game was won at that point, even though Miami would get a late touchdown to make the game close. It was Jones’ second forced fumble of the day. In the first quarter, the Dolphins began a drive at their own 33. Fiedler hit Jed Weaver for 19 yards, but was hit hard by Jones and fumbled. Otis Smith recovered and the Patriots took off on their first scoring drive of the day. On both fumbles, Miami asked for a replay review, and in each case they lost. Despite the heroics of Jones and Faulk (count Coleman in on that list thanks to his pooch kick recovery, and the recovery of the onside kick at the end in which he got blasted by David Bowens), the day belonged to Smith and his incredible day rushing. Smith became the first Patriot running back since Robert Edwards in 1998 to gain 1,000 yards in a season. He ran all day with power, attitude and determination. And he did it despite suffering a contusion in his right leg sometime during the second quarter. On the first drive of the game, Smith sent Miami an early calling card. He converted a third and one at the Dolphin 30 with an 11-yard run off left tackle in which he carried about seven Dolphin tacklers on his back most of the way. It was this blue-and-white blob that oozed for the eleven yards, as the fans shrieked in delight. Smith’s longest run of the contest was a 45-yard beauty in the second period. This one was also off left tackle, even though it was the center, Damien Woody, who laid the key block on the play to spring Smith. This helped set up Pass’s touchdown catch a bit later. Following Brady’s first quarter catch, Smith then ripped off nineteen tough yards before being downed at the Miami two. Once again, it was to the left side, and once again, it was the power of Smith which got the job done. Miami will complain that if they had had Darryl Gardener at inside tackle, Smith would not have had this great a day. If nothing else, it exposed how much middle linebacker Zach Thomas relies on Gardener for his tackle totals. Thomas was a literal non-factor in this game. Winning a big game like this thanks to superb running by Smith is huge. If Smith can maintain this kind of effectiveness into the playoffs, the Patriots will be tough against anybody. Brady did not have a spectacular day (only 108 passing yards), but he suffered no picks and made no stupid plays. This is an allusion to the early days of the Drew Bledsoe Era. Bill Parcells did not want to put Bledsoe into situations where he could lose the game. In effect, Smith is giving Brady much the same thing. Brady doesn’t need to be unreal as long as Smith is gashing the defense. All Brady has to do is run the offense, don’t screw up, and that’s it. That’s how they wanted it for Bledsoe a long time ago, and Brady is enjoying the benefits of that strategy right now. The end of the game was precious. Belichick looked once again like the end of the Jets game (the second one, folks), except he was even more “pumped and jacked” this time. 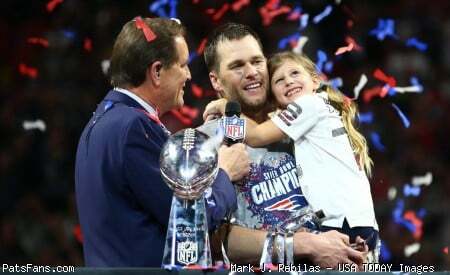 He led the Patriots on a victory lap around the Fox after the game, as he and the players slapped hands with the fans who were still there screaming. It’s really quite unbelievable. 10-5, on the cusp of a playoff berth and maybe a division title. A week off next week to rest and heal, then the 1-12 Panthers at Carolina for the division. A Jet loss Sunday night at Indianapolis makes the Pats division champs if they can beat Carolina. Losses by the Jets, Baltimore or Seattle tomorrow clinch a playoff berth for the Patriots. Isn’t that something? All this hoopla, and the Patriots could still finish out of the playoffs. If they lose to Carolina and the Dolphins, Jets, Ravens and Seahawks all win out…ahhh, shaddup, Bob G.
Just celebrate. Drink many toasts to your favorite football team. Make merry on the 25th, and get that warm, fuzzy feeling that only the holidays can give you. And get ready for maybe another game at Foxborough Stadium. You can’t kill her just yet. A Merry Christmas to you all. The Patriots gave us all a very, very merry one indeed. This entry was posted in Uncategorized on December 23, 2001 by Bob George.